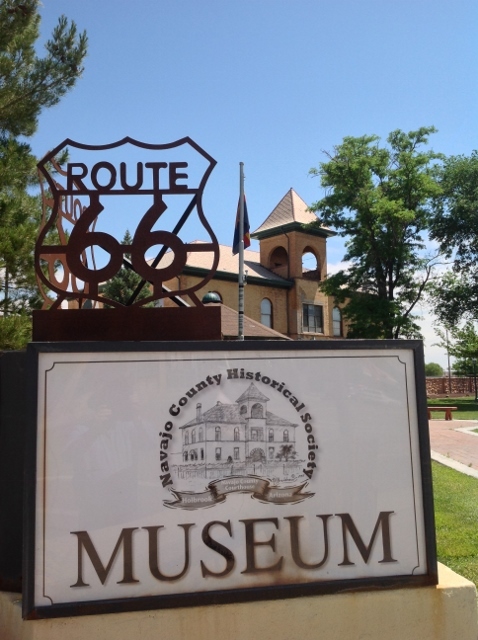 Mark my words, the Route 66 festival in Holbrook is going to be THE event for Route 66 enthusiasts very soon. Where else can you enjoy historic motels, motels where the past and future blend seamlessly, one family owned restaurants that opened in the era of the tail fin, tangible links to more than a century of American road trips, tour a long bypassed segment of Route 66 through a stunningly beautiful national park, take in a movie at an historic theater, visit sites associated with Arizona territorial, history, lawman and gunfighters, and then enjoy traditional Native American dancers under a starlit desert sky? 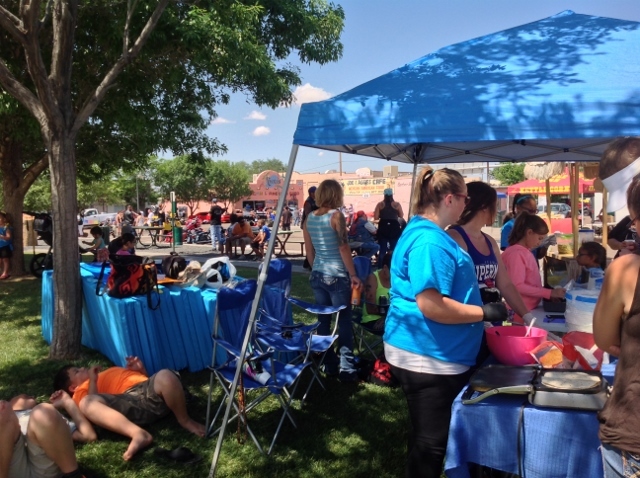 All of this is wrapped around the traditional car show, the vendors, and the family reunion that is a gathering of Route 66 enthusiasts at any Route 66 event. Even though I had a few issues that distracted me and that prevented participation in the relics tour though the Petrified Forest National Park to the Painted Desert Trading Post, for the second year in a row, I had a most delightful time. Even though the event kicked off on Friday morning with the first to two tours through the national park, for me it started shortly after arrival that afternoon. 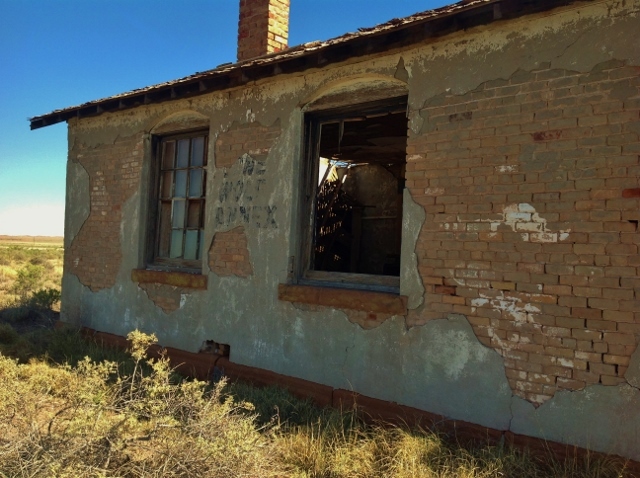 Over a cold beer at the Empty Pockets Saloon, David Heward filled me on festival details, Holbrook news, and provided information about some historic sites that intrigued me. Before the glass could be drained, we were joined by Mike and Sharon Ward, two stalwart contributors to the Route 66 community, as well as sponsors and participants at events from Arizona to Illinois. It was already shaping up to be a most delightful weekend. Next I met with Kathleen Smith at the historic depot, site of the photography exhibition and the location for my Armchair Tour of Route 66 presentation that evening. As is often the case, the trial run for the presentation encountered a few obstacles but with a smile, David and Kathleen soon had them resolved. Behind the success of every community that has used the resurgent interest in Route 66 as a catalyst for revitalization there are unsung heroes, the folks that tirelessly work to promote, to organize, and to roll up their sleeves and put the shoulder to the wheel. Leading that group in Holbrook are David and Kathleen. Filling in the time between the rehearsal and the presentation, the first family reunion for Route 66 enthusiasts took place at Romo’s. Soon we had tables stretching across the restaurant as the Medlin’s and May’s, Ward’s, Dean Kennedy, Heather Petry, Judy Walker, Gary Cron, and others settled in for some excellent food, laughter, and stories. There was little doubt that this was a Route 66 event! I am quite pleased to say that the presentation was well attended, and that a number of people were introduced to the allure of the Route 66 renaissance. In spite of the heat and required intermission every ten minutes as a freight train roared past the windows a few feet away, every one seemed to have a good time. To wrap up the evening, enthusiasts affectionately referred to as “roadies” gathered pool side at the Globetrotter Lodge, my home away from home for the weekend, to sip beer and share stories of Route 66 adventures as well as discoveries. It was a great way to wrap up day one of a most enjoyable festival, and to set the stage for a weekend of adventure. Day two, a delightful breakfast and lively conversation with guests at the Globetrotter Lodge jump started the morning. Afterwards, Nadina and Rob Medlin joined me some exploration. In short order the May’s and Ward’s accompanied the expedition into old Holbrook. 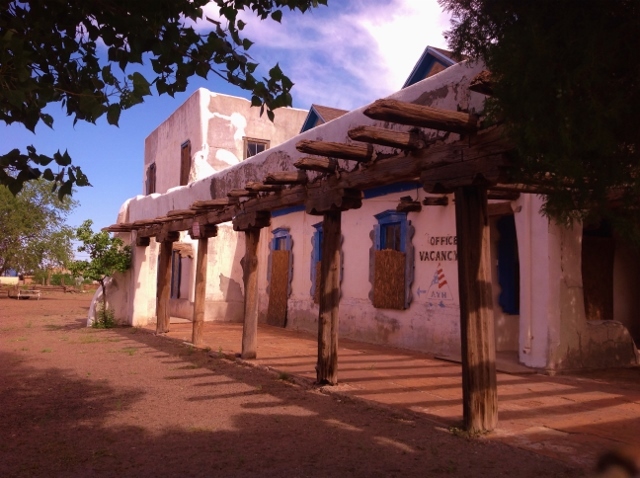 Dominating our discussions and photo expedition was the old Arizona Rancho, a fascinating old property. Established in the early 1880’s, it is believed to be the oldest commercial building in Holbrook. Over the years it served as a ranch house, then with expansion, a boarding house, hospital, and hotel. Then there was a motel wing added at some point in the 1930’s. Also, at some point in its most recent history, it served as a youth hostel. Now, however, it faces a most uncertain future. 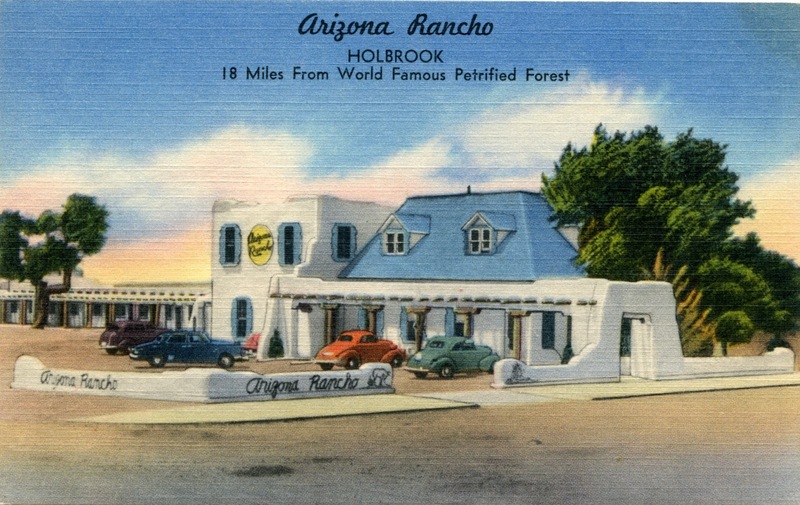 How many hotels or motels on Route 66 have met the needs of travelers who arrived by horse drawn wagon before statehood, by train, and by automobile on the National Old Trails Highway and U.S. 66? This old place could, conceivably, be the needed catalyst for a revitalization of the Route 66 corridor as well as its territorial era business district. Next we headed for the main event, after a visit to a most interesting antique store housed in a late 19th century bank building complete with vintage vault; music, vendors, and block after block of cars. I also made a detour to the historic courthouse (you have to see the territorial era jail!) that serves as an Arizona information center as well as museum to sign books for their gift shop. As it turned out, that was an hours long endeavor; there were books to sign and questions to answer, directions to give and photos to take. I felt like an employee and enjoyed every minute! For dinner our band of intrepid Route 66 enthusiasts swarmed on El Rancho, another great restaurant. Once again it was good food, laughter, stories, and more laughter. And once again, this was followed by another round of poolside discussion and more laughter, and a couple of beers. Sunday morning, after another wonderful Globetrotter breakfast, most of my amigos set out on the relics tour, and I turned my sights toward home. Even though there was a need to hit Kingman early, I couldn’t resist a few quick stops; the old Lone Wolf Annex, a brief visit with Kirk and Yvette Slack, new owners of the historic Zettler’s Market in Ash Fork, and a quick lunch at Grand Canyon Caverns (excellent pie!). To say the very least, it was a grand adventure and a very good time. Of course, as with Route 66 itself, it was the people that really made it a memorable weekend. And yes, I am adding the 2017 festival in Holbrook to the calendar. See you there!